This guide covers planning a cluster, considering hardware, developing storage strategies, configuring gateways and load balancers and using the Ceph Object Gateway. Welcome to the Ceph Object Gateway for Production guide. This guide covers topics for building Ceph Storage clusters and Ceph Object Gateway clusters for production use. This guide is for those who intend to deploy a Ceph Object Gateway environment for production. It provides a sequential series of topics for planning, designing and deploying a production Ceph Storage cluster and Ceph Object Gateway cluster with links to general Ceph documentation where appropriate. This guide assumes the reader has a basic understanding of the Ceph Storage Cluster and the Ceph Object Gateway. Readers with no Ceph experience should consider setting up a small Ceph test environment or using the Ceph Sandbox Environment to get familiar with Ceph concepts before proceeding with this guide. This guide assumes a single-site cluster consisting of a single Ceph Storage cluster and multiple Ceph Object Gateway instances in the same zone. 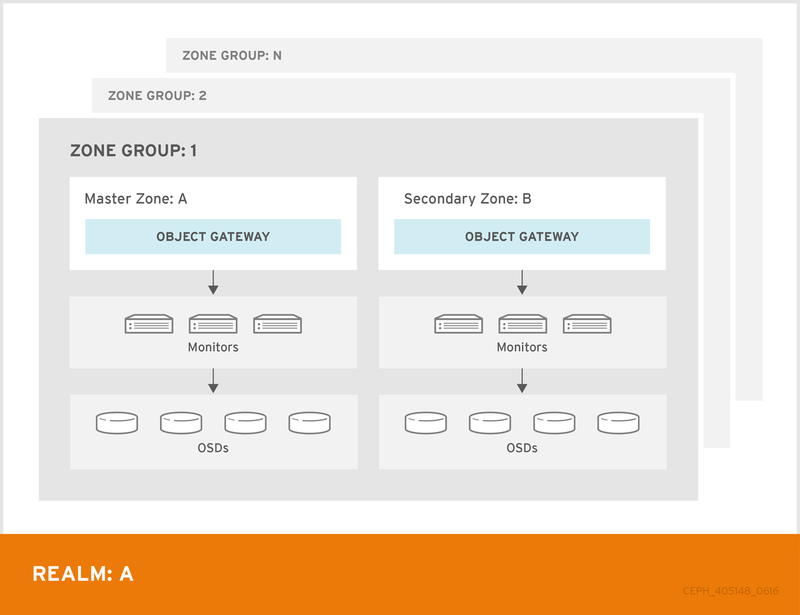 This guide assumes the single-site cluster will expand to a multi-zone and multi-site cluster by repeating the procedures in this guide for each zone group and zone with the naming modifications required for secondary zone groups and zones. This document is intended to complement the hardware, installation, administration and Ceph Object Gateway guides. This guide does not replace the other guides. These factors will have a significant influence when considering hardware. Consider these factors carefully before selecting hardware. Throughput-optimized: A throughput-optimized cluster seeks to ensure fast data access. Host bus adapters (HBAs), storage media with fast sequential read/write characteristics and high network bandwidth provide capability for applications such as graphics, streaming audio and streaming video. Throughput-optimized optimized clusters also consider whether write performance is a consideration. Throughput-optimized clusters that use SSDs for journaling realize substantially better write performance, which can be important for applications like storing CCTV streams. Throughput-optimized clusters should consider the throughput characteristics of a Host Bus Adapter (HBA) controller and network throughput for intensive applications such as streaming 4K video. HBA-based hardware controllers offer significant performance improvements over on-board controllers. Capacity-optimized: A capacity-optimized cluster seeks to ensure the lowest cost per terabyte of storage. Capacity-optimized clusters often use the least expensive storage media and often avoid the added expense of separate SSD journals for applications such as archiving infrequently accessed legacy financial records, old emails, etc. IOPS-optimized: An IOPS-optimized cluster seeks to provide high performance for read- and write-intensive workloads. While IOPS-optimized workloads are not as common for Ceph Object Gateways, they can be supported with SSD, Flash memory or NVMe CRUSH hierarchies. Carefully consider the storage use case(s) BEFORE considering hardware, because it can significantly impact the price and performance of the cluster. For example, if the use case is capacity-optimized and the hardware is better suited to a throughput-optimized use case, the hardware will be more expensive than necessary. Conversely, if the use case is throughput-optimized and the hardware is better suited to a capacity-optimized use case, the cluster may suffer from poor performance. Also, note that since Ceph Object Gateway supports storage policies, it is possible to create CRUSH hierarchies for ALL of the foregoing scenarios and invoke them with storage policies supported in the APIs. See Creating Data Placement Strategies for details. Cluster design should also consider the data durability strategy. Ceph Storage uses either replication or erasure coding to ensure data durability. Replication stores one or more redundant copies of the data across failure domains in case of a hardware failure. However, redundant copies of data can become expensive at scale. For example, to store 1 petabyte of data with triple replication would require a cluster with at least 3 petabytes of storage capacity. The Erasure coding section of the Storage Strategies Guide describes how erasure coding stores data as data chunks and coding chunks. In the event of a lost data chunk, erasure coding can recover the lost data chunk with the remaining data chunks and coding chunks. Erasure coding is substantially more economical than replication. For example, using erasure coding with 8 data chunks and 3 coding chunks provides the same redundancy as 3 copies of the data. However, such an encoding scheme uses approximately 1.5x of the initial data stored compared to 3x with replication. ONLY the data storage pool can use erasure coding. Pools storing system data and bucket indexes use replication. Another important aspect of designing a cluster is to determine if the cluster will be in one data center site or span multiple data center sites. Multi-site clusters benefit from geographically distributed failover and disaster recovery, such as long-term power outages, earthquakes, hurricanes, floods or other disasters. Additionally, multi-site clusters in an active-active configuration can direct client applications to the closest available cluster in the manner of content delivery networks. Placing data as close to the client as possible is increasingly important for throughput intensive workloads such as streaming 4k video. For details of multi-site clusters, see the Multi-site sections of the Object Gateway for Red Hat Enterprise Linux guide. Red Hat recommends identifying realm, zone group and zone names BEFORE creating Ceph Storage pools. Some pool names should be pre-pended with the zone name by convention. Consider these factors BEFORE identifying and purchasing computing and networking hardware for the cluster. One of the most important factors in designing a cluster is to determine the storage requirements (sizing). Ceph Storage is designed to scale into petabytes and beyond. The following examples are common sizes for Ceph storage clusters. Large: 2 petabytes or more. Sizing should include current needs and the needs of the near future. Consider the rate at which the gateway client will add new data to the cluster. That may differ from use-case to use-case. For example, recording CCTV video, 4k video or medical imaging may add significant amounts of data far more quickly then less storage intensive information such as financial market data. Additionally, consider that data durability methods such as replication versus erasure coding will have a significant impact on the storage media required. For additional information on sizing, see the Red Hat Ceph Storage Hardware Guide and its associated links for selecting OSD hardware. Another important aspect of cluster design includes storage density. Generally, a cluster should store data across at least 10 nodes to ensure reasonable performance when replicating, backfilling and recovery. If a node fails, with at least 10 nodes in the cluster, only 10% of the data has to move to the surviving nodes. If the number of nodes is substantially less, a higher percentage of the data must move to the surviving nodes. Additionally, the full_ratio and near_full_ratio need to be set to accommodate a node failure to ensure that the cluster can write data. For this reason, it is is important to consider storage density. Higher storage density isn’t necessarily a good idea. Another factor that favors more nodes over higher storage density is erasure coding. When writing an object using erasure coding and using node as the minimum CRUSH failure domain, the cluster will need as many nodes as data and coding chunks. For example, a cluster using k=8, m=3 should have at least 11 nodes so that each data or coding chunk is stored on a separate node. Hot-swapping is also an important consideration. Most modern servers support drive hot-swapping. However, some hardware configurations require removing more than one drive to replace a drive. Red Hat recommends avoiding such configurations, because they can bring down more OSDs than required when swapping out failed disks. A major advantage of Ceph Storage is that it allows scaling capacity, IOPS and throughput independently. An important aspect of a cloud storage solution is that clusters can run out of IOPS due to network latency and other factors or run out of throughput due to bandwidth constraints long before the clusters run out of storage capacity. This means that the network hardware configuration must support the use case(s) in order to meet price/performance targets. Network performance is increasingly important when considering the use of SSDs, flash, NVMe, and other high performance storage methods. Another important consideration of Ceph Storage is that it supports a front side or public network for client and monitor data, and a back side or cluster network for heart beating, data replication and recovery. This means that the back side or cluster network will always require more network resources than the front side or public network. Depending upon whether the data pool uses replication or erasure coding for data durability, the network requirements for the back side or cluster network should be quantified appropriately. Finally, verify network throughput before installing and testing Ceph. Most performance-related problems in Ceph usually begin with a networking issue. Simple network issues like a kinked or bent Cat-6 cable could result in degraded bandwidth. Use a minimum of 10Gbe for the front side network. For large clusters, consider using 40Gbe for the backend or cluster network. Alternatively, use LCAP mode 4 to bond networks. Additionally, use jumbo frames (MTU 9000), especially on the backend or cluster network. Since Ceph writes are atomic—​all or nothing—​it isn’t a requirement to invest in uninterruptable power supplies (UPS) for Ceph OSD nodes. However, Red Hat recommends investing in UPSs for Ceph Monitor nodes. Monitors use leveldb, which is sensitive to synchronous write latency. A power outage could cause corruption, requiring technical support to restore the state of the cluster. Ceph OSDs may benefit from the use of a UPS if a storage controller uses a writeback cache. In this scenario, a UPS may help prevent filesystem corruption during a power outage if the controller doesn’t flush the writeback cache in time. Since these use cases typically have different drive, HBA controller and networking requirements among other factors, configuring a series of identical hosts to facilitate all of these use cases with a single node configuration is possible, but is not necessarily recommended. Using the same hosts to facilitate multiple CRUSH hierarchies will involve the use of logical, rather than actual host names in the CRUSH map. Additionally, deployment tools such as Ansible would need to consider a group for each use case, rather than deploying all OSDs in the default [osds] group. Generally, it is easier to configure and manage hosts that serve a single use case, such as high IOPS, high throughput, or high capacity. When selecting OSD hardware for use with a Ceph Object Gateway—​irrespective of the use case—​Red Hat recommends considering an OSD node that has at least one SSD drive used exclusively for the bucket index pool. This is particularly important when buckets will contain a large number of objects. A bucket index entry is approximately 200 bytes of data, stored as an object map (omap) in leveldb. While this is a trivial amount of data, some uses of Ceph Object Gateway can result in tens or hundreds of millions of objects in a single bucket. By mapping the bucket index pool to a CRUSH hierarchy of SSD nodes, the reduced latency provides a dramatic performance improvement when buckets contain very large numbers of objects. In a production cluster, a typical OSD node will have at least one SSD for the bucket index, AND at least on SSD for the journal. Ceph monitors use leveldb, which is sensitive to synchronous write latency. Red Hat strongly recommends using SSDs to store monitor data. Ensure that the selected SSDs have sufficient sequential write and throughput characteristics. See the Storage Strategies guide for general guidance on storage strategies and command line usage. When deploying a Ceph cluster and an Object Gateway, typically the object gateway will have a default zone group and zone. The Ceph storage cluster will have default pools, which in turn will use a CRUSH map with a default CRUSH hierarchy and a default CRUSH ruleset. The default rbd pool may use the default CRUSH ruleset. DO NOT delete the default ruleset or hierarchy if Ceph clients have used them to store client data. For general details on CRUSH hierarchies, see the CRUSH Administration section of the Storage Strategies guide. Production gateways typically use a custom realm, zone group and zone named according to the use and geographic location of the gateways. Additionally, the Ceph cluster will have a CRUSH map that has multiple CRUSH hierarchies. System Pools: At least one CRUSH hierarchy will be for system pools and potentially for data. The system pools include .rgw.root and the system pools associated with the zone. System pools typically fall under a single CRUSH hierarchy, and use replication for data durability. A data pool may also use the CRUSH hierarchy, but the pool will usually be configured with erasure coding for data durability. Bucket Index: At least one CRUSH hierarchy SHOULD be for the bucket index pool, where the CRUSH hierarchy maps to SSD drives. Bucket indices can be a performance bottleneck. It is strongly recommended to use SSD drives in this CRUSH hierarchy. DO NOT create partitions for bucket indices on SSDs used for OSD journals . Additionally, a bucket index should be configured with bucket sharding. See Creating a Bucket Index Pool and supporting links for details. Placement Pools: The placement pools for each placment target include the bucket index, the data bucket and the bucket extras. These pools may fall under separate CRUSH hierarchies. Since Ceph Object Gateway can support multiple storage policies, the bucket pools of the storage policies may be associated with different CRUSH hierarchies, reflecting different use cases such as IOPS-optimized, throughput-optimized, and capacity-optimized respectively. The bucket index pool SHOULD use its own CRUSH hierarchy to map the bucket index pool to higher performance SSD drives. From the command line on the administration node, create CRUSH roots in the CRUSH map for each CRUSH hierarchy. There MUST be at least one CRUSH hierarchy for system pools that may also potentially serve data storage pools. There SHOULD be at least one CRUSH hierarchy for the bucket index pool, mapped to SSDs or other high speed data storage media. For details on CRUSH hierarchies, see CRUSH Hierarchies. To manually edit a CRUSH map, see Editing a CRUSH Map. In the following examples, the hosts named data0, data1 and data2 use extended logical names such as data0-sas-ssd, data0-index and so forth in the CRUSH map, because there are multiple CRUSH hierarchies pointing to the same physical hosts. Create a separate CRUSH hierarchy with different SSD drives to store data in SSDs. DO NOT use the same SSD drive to store journals, bucket indexes and data. In the foregoing example, the host data2 uses the logical name data2-sas-ssd to map the SAS drives with journals on SSDs into one hierarchy. The OSD IDs osd.0 through osd.3 in the forgoing example represent SAS drives using SSD journals in a high throughput hardware configuration. These OSD IDs differ from the OSD ID in the following example. In the following example, the host data2 uses the logical name data2-index to map the SSD drive for a bucket index into a second hierarchy. The OSD ID osd.4 in the following example represents an SSD drive or other high speed storage media used exclusively for a bucket index pool. When using logical host names, ensure that one of the following settings is present in the Ceph configuration file to prevent the OSD startup scripts from using the actual host names upon startup and thereby failing to locate data in CRUSH map. osd crush location = "host=data2-sas-ssd"
osd crush location = "host=data2-index"
If one of the foregoing approaches isn’t used when a CRUSH map uses logical host names rather than actual host names, on restart, the Ceph Storage Cluster will assume that the OSDs map to the actual host names, and the actual host names will not be found in the CRUSH map, and Ceph Storage Cluster clients will not find the OSDs and their data. Like the default CRUSH hierarchy, the CRUSH map also contains a default CRUSH ruleset, usually ruleset 0. The default rbd pool may use this ruleset. DO NOT delete the default ruleset if other pools have used it to store customer data. See CRUSH Rules for general details on CRUSH Rules. To manually edit a CRUSH map, see Editing a CRUSH Map. For each CRUSH hierarchy, create a CRUSH rule. The following example illustrates a rule for the CRUSH hierarchy that will store the system pools, including .rgw.root. In this example, the root sas-ssd serves as the main CRUSH hierarchy. It uses ruleset 1 to distinguish itself from the default ruleset 0. The step take sas-ssd line tells the pool to use the sas-ssd root created in CRUSH Root, whose child buckets contain OSDs with SAS drives and SSD journals in a high throughput hardware configuration. The type rack portion of step chooseleaf is the failure domain. In the following example, it is a rack. In the foregoing example, if data gets replicated three times, there should be at least three racks in the cluster containing a similar number of OSD nodes. The type replicated setting has NOTHING to do with data durability, the number of replicas or the erasure coding. Only replicated is supported. The following example illustrates a rule for the CRUSH hierarchy that will store the data pool. In this example, the root sas-ssd serves as the main CRUSH hierarchy—​the same CRUSH hierarchy as the system rule. It uses ruleset 2 to distinguish itself from the default ruleset 0 and ruleset 1. The step take sas-ssd line tells the pool to use the sas-ssd root created in CRUSH Root, whose child buckets contain OSDs with SAS drives and SSD journals in a high throughput hardware configuration. The type host portion of step chooseleaf is the failure domain. In the following example, it is a host. Notice that the rule uses the same CRUSH hierarchy, but a different failure domain. In the foregoing example, if the pool uses erasure coding with a a larger number of data and encoding chunks than the default, there should be at least as many racks in the cluster containing a similar number of OSD nodes to facilitate the erasure coding chunks. For smaller clusters, this may not be practical, so the foregoing example uses host as the CRUSH failure domain. The following example illustrates a rule for the CRUSH hierarchy that will store the index pool. In this example, the root index serves as the main CRUSH hierarchy. It uses ruleset 3 to distinguish itself from ruleset 0 through ruleset 2. The step take index line tells the pool to use the index root created in CRUSH Root, whose child buckets contain OSDs SSD drives for high IOPS. The type rack portion of step chooseleaf is the failure domain. In the following example, it is a rack. The Ceph Object Gateway configuration gets stored in a pool named .rgw.root, including realms, zone groups and zones. By convention, its name is not prepended with the zone name. For system pools, including .rgw.root, the suggested PG count from the Ceph Placement Groups (PGs) per Pool Calculator is substantially less than the target PGs per OSD. Also, ensure the number of OSDs is set in step 3 of the calculator. Once this pool gets created, the Ceph Object Gateway can store its configuration data in the pool. The Ceph Storage pools supporting the Ceph Object Gateway apply to a zone within a zone group. By default, Ceph Object Gateway will define a default zone group and zone. For the master zone group and zone, Red Hat recommends creating a new realm, zone group and zone. Then, delete the default zone and its pools if they were already generated. Use Configuring a Master Zone as a best practice, because this configures the cluster for Multi Site operation. Create a realm. See Realms for additional details. Create a master zone group. See Zone Groups for additional details on zone groups. Create a master zone. See Zones for additional details on zones. Delete the default zone group and zone. You MAY delete default pools if they were created, and are not storing client data. DO NOT delete the .rgw.root pool. Update the Ceph Configuration file. This procedure omits the step of starting the gateway, since the gateway may create the pools manually. To specify specific CRUSH rulesets and data durability methods, create the pools manually. By setting up a new realm, zone group and zone, the cluster is now prepared for expansion to a multi site cluster where there are multiple zones within the zone group. This means that the cluster can be expanded and configured for failover, and disaster recovery. See Expanding the Cluster with Multi Site for additional details. In Red Hat Ceph Storage 2, multi site configurations are active-active by default. When deploying a multi site cluster, the zones and their underlying Ceph storage clusters may be in different geographic regions. Since each zone has a deep copy of each object in the same namespace, users can access the copy from the zone that is physically the closest to them, reducing latency. However, the cluster may be configured in active-passive mode if the secondary zones are intended only for failover and disaster recovery. Using a zone group with multiple zones is supported. Using multiple zone groups is a technology preview only, and is not supported in production. The Ceph Object Gateway uses many pools for various system functions, and a separate set of placement pools for storing bucket indexes, data and other information. Since it is computationally expensive to peer a pool’s placement groups, Red Hat generally recommends that the Ceph Object Gateway’s system pools use substantially fewer placement groups than data storage pools. The system pools store objects related to system control, garbage collection, logging, user information, usage, etc. By convention, these pool names have the zone name prepended to the pool name. .<zone-name>.rgw.gc: The garbage collection pool, which contains hash buckets of objects to be deleted. .<zone-name>.log: The log pool contains logs of all bucket/container and object actions such as create, read, update and delete. .<zone-name>.intent-log: The intent log pool contains a copy of an object update request to facilitate undo/redo if a request fails. .<zone-name>.users.uid: The user ID pool contains a map of unique user IDs. .<zone-name>.users.keys: The keys pool contains access keys and secret keys for each user ID. .<zone-name>.users.email: The email pool contains email addresses associated to a user ID. .<zone-name>.users.swift: The Swift pool contains the Swift subuser information for a user ID. .<zone-name>.usage: The usage pool contains a usage log on a per user basis. Execute the Get a Zone procedure to see the pool names. From previous examples, the rgw-system ruleset represents a CRUSH hierarchy of SAS drives with SSD journals and rack as the CRUSH failure domain. See Creating CRUSH Roots, and Creating CRUSH Rulesets for preceding examples. See the Ceph Placement Groups (PGs) per Pool Calculator and Placement Groups for details on the number of PGs. See Create a Pool for details on creating a pool. For system pools the suggested PG count from the calculator is substantially less than the target PGs per OSD. Ensure that step 3 of the calculator specifies the correct number of OSDs. Generally, the .rgw.root pool and the system pools should use the same CRUSH hierarchy and use at least node as the failure domain in the CRUSH ruleset. Like the .rgw.root pool, the system pools should use replicated for data durability, NOT erasure. The Ceph Object Gateway has a default storage policy called default-placement. If the cluster has only one storage policy, the default-placement policy will suffice. This default placement policy is referenced from the zone group configuration and defined in the zone configuration. See Storage Policies for additional details. For clusters that support multiple use cases, such as IOPS-optimized, throughput-optimized or capacity-optimized, a set of placement targets in the zone group configuration and a set of placement pools in the zone configuration represent each storage policy. By default, Ceph Object Gateway maps a bucket’s objects to a bucket index, which enables a gateway client to request a list of objects in a bucket among other things. While common use cases may involve quotas where users have a bucket and a limited number of objects per bucket, buckets can store innumerable objects. When buckets store millions of objects, bucket index performance benefits substantially from using SSDs or other high performance storage media to store its data. Additionally, bucket sharding also dramatically improves performance. The PG per Pool Calculator recommends a smaller number of PGs per pool for the bucket index pool; however, the PG count is approximately twice the number of PGs as the system pools. From previous examples, the rgw-index ruleset represents a CRUSH hierarchy of SSD drives and rack as the CRUSH failure domain. See Selecting SSDs for Bucket Indexes, Creating CRUSH Roots, and Creating CRUSH Rulesets for preceding examples. If buckets will store more than 100k objects, configure bucket sharding to ensure that bucket index performance doesn’t degrade as the number of objects in the bucket increases. See Configuring Bucket Sharding. Also see Bucket Index Resharding for details on resharding a bucket if the original configuration is no longer suitable. The data pool is where Ceph Object Gateway stores the object data for a particular storage policy. The data pool should have a full complement of PGs, not the reduced number of PGs for system pools. The data pool SHOULD consider using erasure coding, as it is substantially more efficient than replication and can significantly reduce the capacity requirements while maintaining data durability. To use erasure coding, create an erasure code profile. See Erasure Code Profiles in the Storage Strategies Guide for more details. Choosing the correct profile is important because you cannot change the profile after you create the pool. To modify a profile, you must create a new pool with a different profile and migrate the objects from the old pool to the new pool. The default configuration is two data chunks and one encoding chunk, which means only one OSD can be lost. For higher resiliency, consider a larger number of data and encoding chunks. For example, some large very scale systems use 8 data chunks and 3 encoding chunks, which allows three OSDs to fail without losing data. Each data and encoding chunk SHOULD get stored on a different node or host at a minimum. For smaller clusters, this makes using rack impractical as the minimum CRUSH failure domain when using a larger number of data and encoding chunks. Consequently, it is common for the data pool to use a separate CRUSH hierarchy with host as the minimum CRUSH failure domain. Red Hat recommends host as the minimum failure domain. If erasure code chunks get stored on OSDs within the same host, a host failure such as a failed journal or network card could lead to data loss. From previous examples, the rgw-throughput ruleset represents a CRUSH hierarchy of SAS drives with SSD journals and host as the CRUSH failure domain. See Creating CRUSH Roots, and Creating CRUSH Rulesets for preceding examples. The data_extra_pool is for data that cannot use erasure coding. For example, multi-part uploads allow uploading a large object such as a movie in multiple parts. These parts must first be stored without erasure coding. Erasure coding will apply to the whole object, not the partial uploads. The PG per Pool Calculator recommends a smaller number of PGs per pool for the data_extra_pool; however, the PG count is approximately twice the number of PGs as the system pools and the same as the bucket index pool. The placement_targets section will list each storage policy. By default, it will contain a placement target called default-placement. The default placement target is identified immediately after the placement_targets section. Once the zone group has the new throughput-optimized placement target, map the placement pools for throughput-optimized in the zone configuration. This step will replace the mapping for default-placement to its associated pools with a throughput-optimized set of placement pools. The index_pool points to the index pool and CRUSH hierarchy with SSDs or other high-performance storage, the data_pool points to a pool with a full complement of PGs, and a CRUSH hierarchy of high-throughput host bus adapters, SAS drives and SSDs for journals. When processing client requests, the Ceph Object Gateway will use the the new throughput-optimized target as the default storage policy. Use this procedure to establish the same target in different zones and zone groups in a multi-site configuration, replacing the zone name for the pools as appropriate. Use this procedure to establish additional storage policies. The naming for each target and set of placement pools is arbitrary. It could be fast, streaming, cold-storage or any other suitable name. However, each set must have a corresponding entry under placement_targets in the zone group, and one of the targets MUST be referenced in the default_placement setting; and, the zone must have a corresponding set of pools configured for each policy. Client requests will always use the default target, unless the client request specifies X-Storage-Policy and a different target. See Create a Container for an object gateway client usage example. Depending on the choices made during installation of the Ceph Object Gateway, the Ceph configuration file will already have entries for each instance of the Ceph Object Gateway with additional modifications from the steps involved in Configuring a Realm. The most common configuration change from the default configuration is changing the default port 7480 to another port such as 8080 or 80. See Changing the Default Port. There are additional settings particular to Civetweb. See Civetweb Configuration Options for details. There are additional settings which may be overridden. See Object Gateway Configuration Reference for details. The section on Additional Use Cases will provide detailed configuration examples for using Ceph Object Gateway with third party components. When changing the default port for Civetweb, ensure that the corresponding ports are open for client access. See Configuring the Firewall for details. S3-style subdomains incorporate the bucket name as a CNAME extension. Add a wildcard to the DNS to facilitate S3-style subdomains. See Adding a Wildcard to DNS for details. A zone will typically have multiple instances of a Ceph Object Gateway to handle production loads and to maintain high availability. Production clusters typically use a load balancer to allocate requests among gateway instances. Additionally, earlier versions of Civetweb do not support HTTPS. A load balancer can be configured to accept SSL requests, terminate the SSL connection and pass the request over HTTP to the gateway instances. Ceph Storage aims to maintain high availability. For this reason, Red Hat recommends using HAProxy/keepalived. See HAProxy/keepalived Configuration for details. Once the cluster is up and running, there are additional use cases to consider. When developing storage strategies, the procedure for Creating a Realm ensured that the cluster is already configured to use multi-site with its own realm, master zone group and master zone. A typical production cluster will have a secondary zone with its own Ceph Storage Cluster in a separate physical location to act as a backup in the event of a disaster. To set up a secondary zone, repeat the procedures in this guide. Generally, the secondary zone should have the same hardware configuration and sizing as the master zone. See Configuring a Secondary Zone for additional details. Adding a secondary zone adds Failover and Disaster Recovery capabilities to the cluster. If the Ceph Object Gateway and Ceph Storage Cluster replaces a filesystem-based storage solution, consider using Ceph’s NFS-Ganesha solution to migrate data from the file system into Ceph Object Gateway. See Exporting the Namespace to NFS-Ganesha (TECH PREVIEW). Traditional web hosting sometimes involves setting up a web server for each website, which can use resources inefficiently when content doesn’t change dynamically. Ceph Object Gateway can host static web sites in S3 buckets—​that is, sites that do not use server-side services like PHP, servlets, databases, nodejs and the like. This approach is substantially more economical than setting up VMs with web servers for each site. See Configuring Gateways for Static Web Hosting for additional details. Organizations deploying Ceph Object Gateway for their users and applications may choose to use Light-weight Directory Access Protocol (LDAP) or Microsoft Active Directory (AD) to authenticate with the Ceph Object Gateway in lieu of creating Ceph Object Gateway users. Using LDAP/AD means that Ceph Object Gateway can integrate with an organizations LDAP/AD single sign-on initiatives. See the Ceph Object Gateway with LDAP/AD Guide for details. When deploying the Ceph Object Gateway in lieu of OpenStack Swift, it is possible to configure the gateway to use OpenStack Keystone to authenticate users in lieu of creating Ceph Object Gateway users. See Using Keystone to Authenticate Ceph Object Gateway Users for details.